The ancestors of Josiah Bartlett were from Normandy, whence they emigrated to England. The name was conspicuous in English History at an early date. Toward the close of the seventeenth century a branch of the family emigrated to America, and settled in the town of Beverley, in Massachusetts. Josiah was born in Amesbury, in Massachusetts, in November, 1729. His mother's maiden name was Webster, and she was a relative of the family of the great statesman of that name of our time. 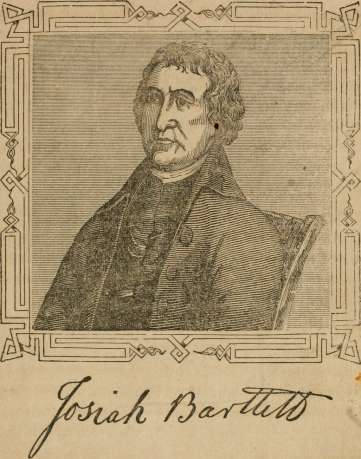 Young Bartlett lacked the advantage of a collegiate education, but he improved an opportunity for acquiring some knowledge of the Greek and Latin, which offered in the family of a relative, the Rev. Doctor Webster. He chose for a livelihood the practice of the medical profession, and commenced the study of the science when he was sixteen years old. His opportunities for acquiring knowledge from books were limited, but the active energies of his mind supplied the deficiency, in a measure, and he passed an examination with honor at the close of his studies. He commenced practice at Kingston in New Hampshire, and proving skillful and successful, his business soon became lucrative, and he amassed a competency. Mr. Bartlett was a stern, unbending republican in principle, yet, notwithstanding this, he was highly esteemed by Wentworth, the royal governor,1 and received from him a magistrate's commission, and also the command of a regiment of militia. In 1765 he was elected a member of the provincial legislature of New Hampshire. 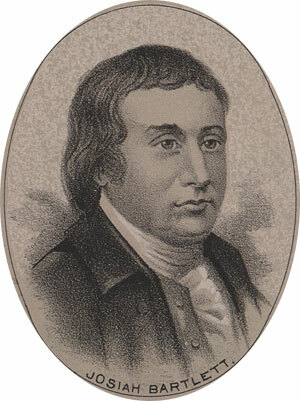 It was at the time when the Stamp Act2 was before the British Parliament, and Mr. Bartlett soon became a prominent leader of a party that opposed the various oppressive measures of the home government. Through Wentworth, magnificent bribes were offered him, but his patriotism was inflexible. In 1776 he was appointed a member of the Committee of Safety of his State. The governor was alarmed when this committee was appointed, and to prevent the transaction of other business of a like nature, he dissolved the Assembly. They re-assembled in spite of the governor, and Dr. Bartlett was at the head of this rebellious movement. He was soon after elected a member of the Continental Congress,3 and in 1775, Governor Wentworth struck his name from the magistracy list, and deprived him of his military commission. Still he was active in the provincial assembly, and the governor, despairing of reconciliation, and becoming somewhat alarmed for his own safety, left the province. The provincial Congress4 assumed the reins of government, and immediately re-appointed Dr. Bartlett colonel of militia. In August, 1775, he was again chosen a delegate to the Continental Congress, and was again re-elected in 1776. He was one of the committee appointed to devise a plan for the confederation of the States," (June 1776) as proposed, by Dr. Franklin. He warmly supported the proposition for independence, and when, on the second of August, 1776, the members of Congress signed the Declaration, Dr. Bartlett was the first who affixed his signature, New Hampshire being the first State called. In 1778, he obtained leave from Congress to visit his family and look after his private affairs, which had become much deranged. He did not resume his seat again in that body. In 1779 he was appointed Chief Justice of the Court of Common Pleas of New Hampshire, and the muster master of its troops. He was afterward raised to the bench of the Supreme Court. He took an active part in the Convention of his State, in favor of the Constitution of 1787, and when it was adopted, he was elected a member of the first Senate that convened under it in the city of New York. But he declined the honor, and did not take his seat there. He had been previously chosen President of New Hampshire, and held that responsible office until 1793, when he was elected the first governor of that State, under the Federal Constitution.5 He held the office one year, and then resigning it, he retired to private life, and sought that needful repose which the declining years of an active existence required. He had served his country faithfully in its hour of deepest peril, and the benedictions of a free people followed him to his domestic retreat. But he was not permitted long to bless his family with his presence, nor was he allowed to witness his country entirely free from perils of great magnitude, that threatened its destruction, while the elements of the new experiment in government were yet unstable, for in 1795 death called him away. He died on the nineteenth of May of that year, in the sixty-sixth year of his age. 1As a general rule the royal governors looked with disfavor upon all democratic movements, and withdrew and withheld their support from those who manifested decided republicanism in their sentiments. The obvious reason for this was, that the voice of republicanism sounded in their ears like the death knell of their power and place. 2 The Stamp Act required all legal instruments of writing, such as wills, deeds, mortgages, marriage certificates, &c, to be written upon paper stamped with the royal arms of Britain. An officer called a "Stamp Master" was appointed to sell them, and thus Great Britain indirectly taxed her American colonies without their consent. 3 First convened at Philadelphia, on the fourth of September, 1774. 4 Before actual hostilities commenced, nearly all the colonies were acting independent of the royal governors and their councils, and provincial Congresses were organized, which performed all the duties of independent State legislatures. 5 So jealous were the people of State Rights, that the Federal Constitution was warmly opposed in many parts of the Union, because of its apparent nullification of those rights, and that is the reason why several of thee States so long delayed to ratify that instrument. The following table exhibits the dates of the ratification of the Constitution by the thirteen old States.